Regulators in Africa and India are working actively to ensure consumers (and the global banking system) are protected in the exciting confluence of mobile and finance. Their involvement is completely appropriate given the opportunity to improve the lives of millions of unbanked people around the world. Defining responsibility and the commensurate controls associated with connecting non-traditional (unregulated) networks to highly regulated banks is a herculean effort which may lead emerging markets to remake a “payment system” that is more efficient than that which exists in today’s developed countries. This opportunity for “leap frog” improvements will be driven by the unique path emerging markets are evolving. Key stakeholders will be able to leverage learnings of developed countries, and trials in emerging markets, as they develop infrastructure necessary to support a network that enables both financial services and telecommunications. Today’s regulatory approach, within these emerging markets, may be best summarized as an “experimental period” with simplified controls. Very early regulations have focused on simplicity by ensuring that the “value” stays within the MNO network, and limiting: balances, ticket size and beneficiaries. By constraining transfer of “value” to well defined MNO services (ex top-ups) regulators have certainly addressed many risk, AML and audit issues. These early controls have provided time for regulators to review progress and fashion new regulations in which existing regulated entities can comment. This order, with which emerging economies are proceeding, may come as a shock to some in the developed world. B) Review. Require submittal of plans to both communication and banking regulators. C) Establish. Legal/Regulatory accountability. Define responsibility and audit guidelines for responsible regulators. For example in Kenya their was very little consumer protections for electronic transactions, the Kenya’s electronic transactions act was just established this year and serves as a model for Africa. D) Define Audit responsibility for MNO. May force partnership with regulated bank for clearing and settlement. Set auditing guidelines for MNOs under communications regulations (Monitor/audit payments and transfers). E) Constrain. Set limits on MNO services and “value” allowed to accumulate in MNO “wallet”, …etc. Example RS 5000 in India, Prohibit/restrict any bank functions in MNO. ex, No interest bearing accounts. F) Isolate. Restrict payments connections external networks. Ex in Africa.. Commercial “beneficiaries/payees” must be approved over a certain volume threshold. (regulatory Instrumentalism). Note: MNOs have addressed this by shifting value to a “regulated” payment (ex. Pre-paid card) and partnerships. G) Enforce KYC responsibility for MNOs engaging in payments at Cash in/out points. Example retail partner is responsible for validating identity. It is difficult for established businesses to create effective business models “down market” from their current customer base (see Clayton Christensen – Innovators Dilemma). MNOs may be best positioned to execute, on the mobile money value proposition, given that the “unbanked market” is market that they serve much more effectively today (reputation/brand/service/efficiency), and the fact that “mobile money” is a key to sustaining their growth. I cannot underestimate this point. For banks serving the unbanked represents a low margin (if not money loosing) value proposition for all of their current products. Similarly, payments are a profit neutral business for banks separate from the lending or commercial services which surround them. Bank product lines are typically not focused on accounts with balances of less the RS 5,000 ($100). In addition, existing Bank systems typically do manage millions of small ticket real time money transfers (think SEPA or Wire) with associated risk, authorization, and AML controls. This “gap” in serving emerging markets is prompting indigenous efforts (ex RBIs: RTGS, National Infrastructure for Mobile Payments, and India Card). For MNOs in emerging markets, mobile money is aligned to their current business and in fact essential for growth. Allowing “cash in” and “transfer” enables customer usage through pre-paid plans. For MNO consumers, access to money services provides ADDITIONAL value to their EXISTING MNO relationship (more on this later). MNO success in “mobile money” is assured because the service further enhances the EXISTING MNO business model, a model which the team and infrastructure to: market, sell and service the unbanked is established (and profitable). The consumer value in mobile money stems from the macro economic transformation that exchange of value provides in moving from “informal” communication to money centered “business” communication. Payments and value may well evolve differently in emerging markets over the next 5 years as payments, telecommunication, regulation and new services establish a unique ecosystem that serves 1 Billion consumers never “connected” to the world’s economy. It is the combination of “network access” and “value access” that provides transformational opportunities to the world’s consumers. This market dynamic leads to transformational “leap frog” opportunities within emerging markets. The principle challenge for MNOs to address is in emerging markets is: fragmentation. A large reason Vodafone was successful in Kenya was that they had 80% of share. Fragmentation of consumers in highly competitive mobile markets, combined with conflicting standards, technology and retail partnerships may cause consumer confusion. This chaos is anathema to the “trust” necessary to establish consumer confidence in payments and value storage. For example, in Nigeria can you pay your utility bill on any cell plan? Dominant MNOs will likely race to establish payment networks and partnerships, even in the constrained regulatory environment. Less dominant MNOs will likely look to regulators, standards, interoperability and other mechanisms to level the playing field. It is essential that MNOs get this right the first time, as “trust” is something earned over many years and quickly destroyed. Nature of network effects are that you must deliver value to everyone on the network (whether a bank or an MNO). Successful networks must have established physical distribution points. Objective in payments is to establish use and acceptance. Example, receive your pension… now establish a savings account, or send money to your grandson. Trust.. Serviceability, manageability, and risk management in “simple services”. “Participating” on the mobile network. Micro lending through “supporting role”. In emerging markets, I would expect to see rapid evolution constrained only by regulation. Expect to see very simple services that can have very broad impact, and support MNOs existing value. A key distribution point for these services are local agents. For those of you in the US, think of these agents as the local “country store” of 80 years ago, trusted members of the community that frequently extend informal credit. Banks in Kenya are just gained access to agents in distribution of their services in order to compete with Vodafone and ZAP. MNOs have very solid SMS development skills. 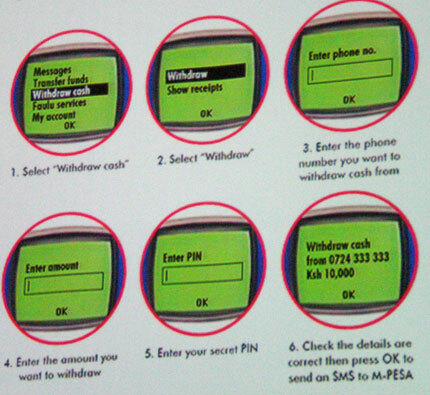 Look at MPESA, ZAP, GCASH.. who developed the software behind them? The MNO. Simplicity lends itself to better risk management, a key for reinforcing the “integrity” of a new payment system. Solid risk management is even more pronounced in the face of new regulations. CEO visibility with MNOs, Banks and Retailers. Paying a “US Vendor” for anything relating to a payment function is not likely. Citi mobile teams have built tremendous SMS applications in weeks (sorry Silicon Valley). Government Visibility. In addition to CEOs, governments and regulators are highly involved in addressing the needs of their citizens, whether “unbanked” or “unphoned”. Regulators globally are looking to share learnings from Kenya, Philippines, India, … Banks expect between 600M-800M people will gain first time access to financial services over the next 8 years. A tremendous market, that will be served much differently then banks (and retailers/MNOs) have operated in the past. Assist MNOs, Banks and Businesses in compliance and reporting. Bank connection to MNO networks. Ex: micro lending… receive your pension… now establish a savings account, or send money to your grandson. ISVs should look at supporting services in connecting business to this new network. Superb analysis and insights. I especially liked the “innovator’s dilemna” reference, since this is a service, not a cheaper, faster hi-tech innovation. Mobile payments may be compared to rural electrification in the US, which transformed and modernized much of the Southeast. Great insights. Do you have a similar analysis for the developed markets?